Peru was literally a 30-minute bus ride from Copacabana and crossing the border was a piece of cake. 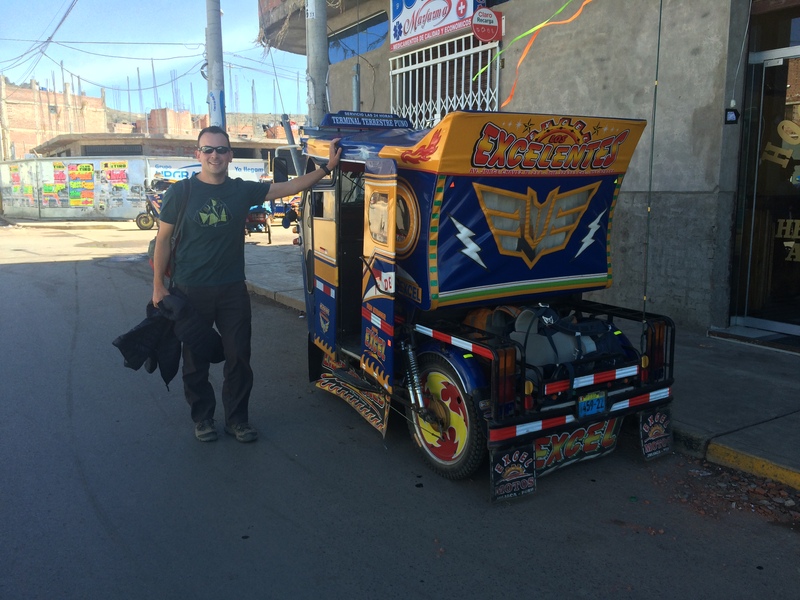 Four hours later we were in Puno, Lake Titicaca on the Peruvian side. To our amusement, Southeast Asian-like tuk-tuks or moto taxis can be found everywhere. For 4 soles (~$1.33) we got a ride to the town center. 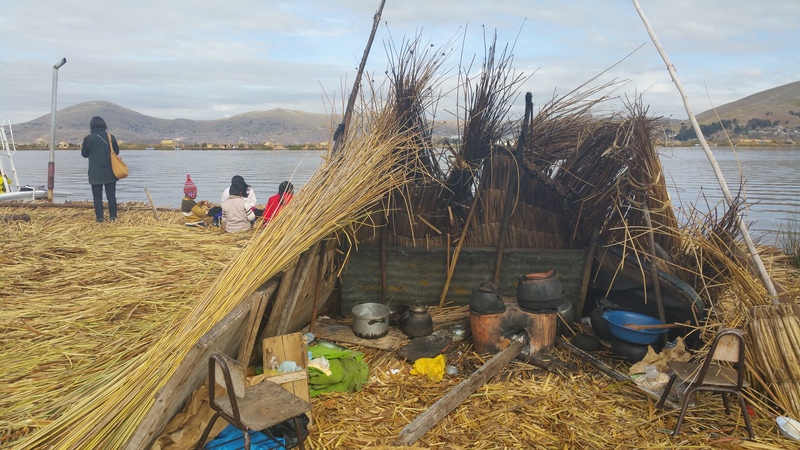 Rather than booking a group tour to the famous but touristy islands off the coast of Puno, we simply showed up at the port early the next morning around 7am to find a boat that would take us to Las Islas de Uros and Isla Taquile. After chatting with a couple of indigenous folks (whose second language is Spanish!) 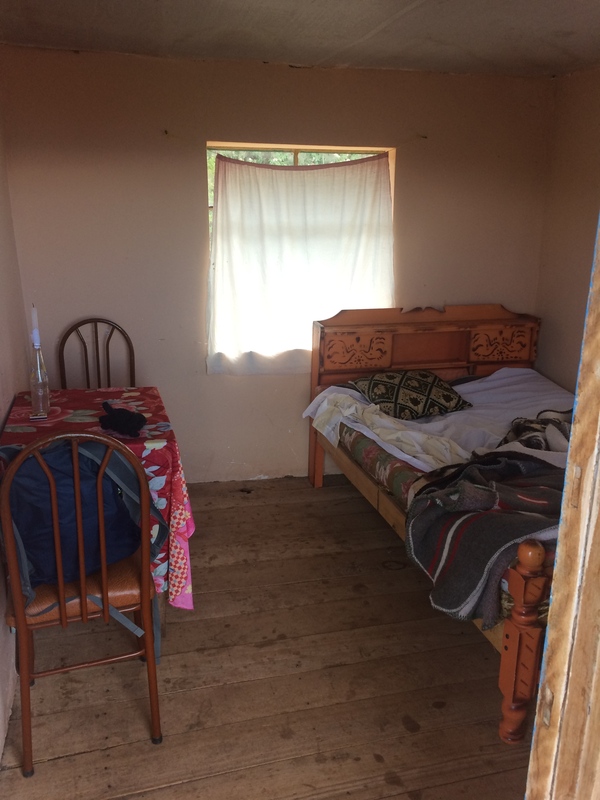 we ended up purchasing a round-trip ticket from Puno to Uros to Taquile and back to Puno the next day for 25 soles pp (~$8.33). 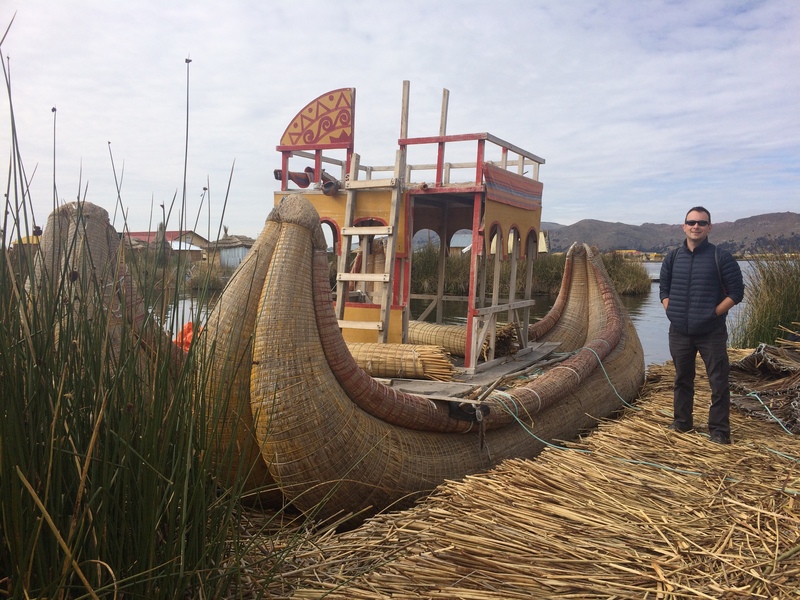 Our goal was to check out the fascinating Uros Islands and then spend a night on Taquile with the indigenous people of Peru. 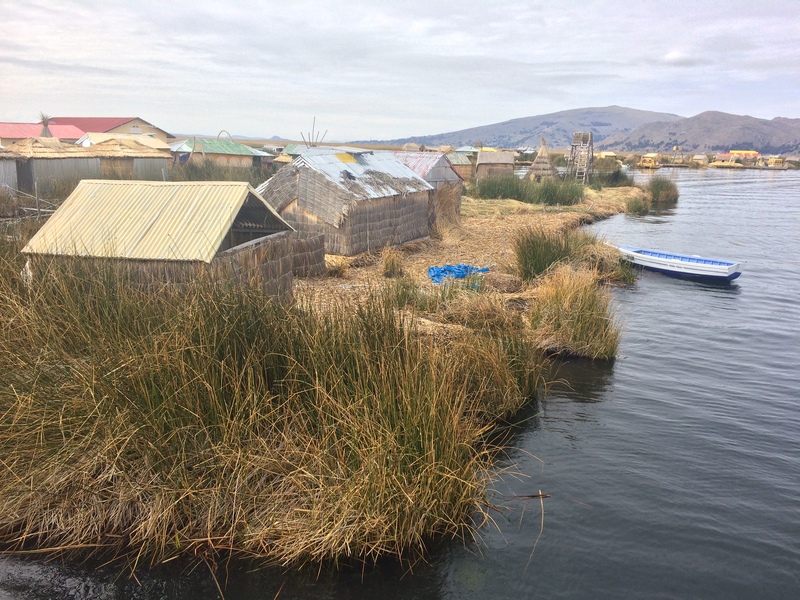 The first stop was the floating islands of Uros, which was only about a 20-minute slow boat ride from Puno. 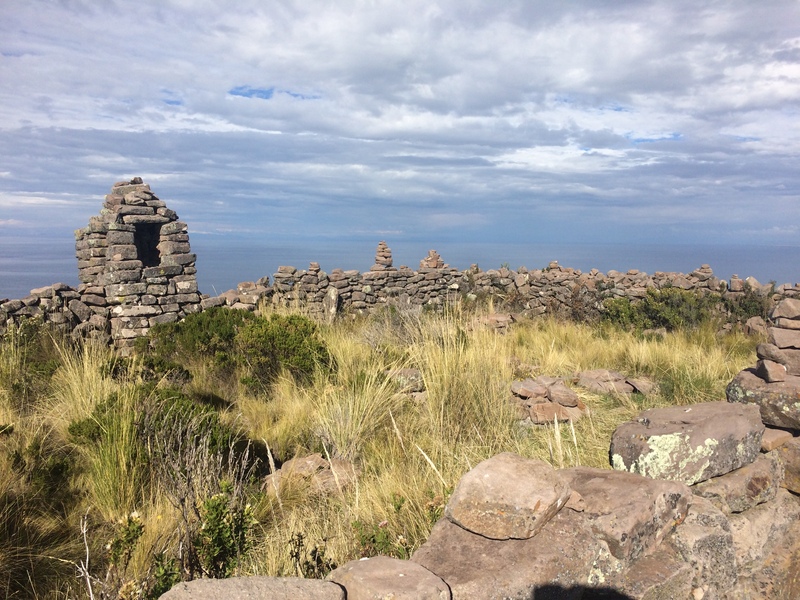 What makes these islands so fascinating is its history; long ago the people constructed their own islands and structures out of reeds to live in isolation and protection from the people of the mainland. 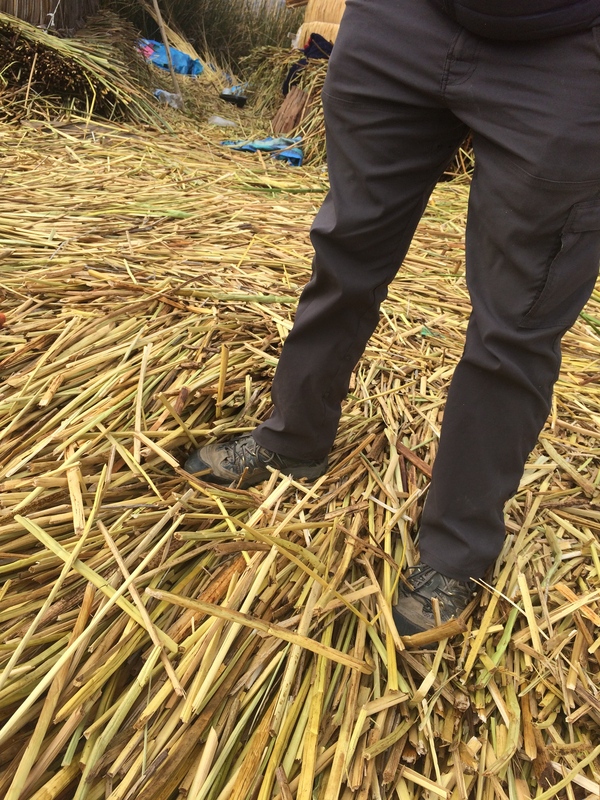 Because the reeds are always deteriorating, the inhabitants lay down new reeds on a weekly or biweekly basis to preserve their homes. There are over 50 islands with the oldest island being more than 100 years old and the youngest around 11 years old, with several families living on each island. There are schools, restaurants, and even a post office on some of these islands! 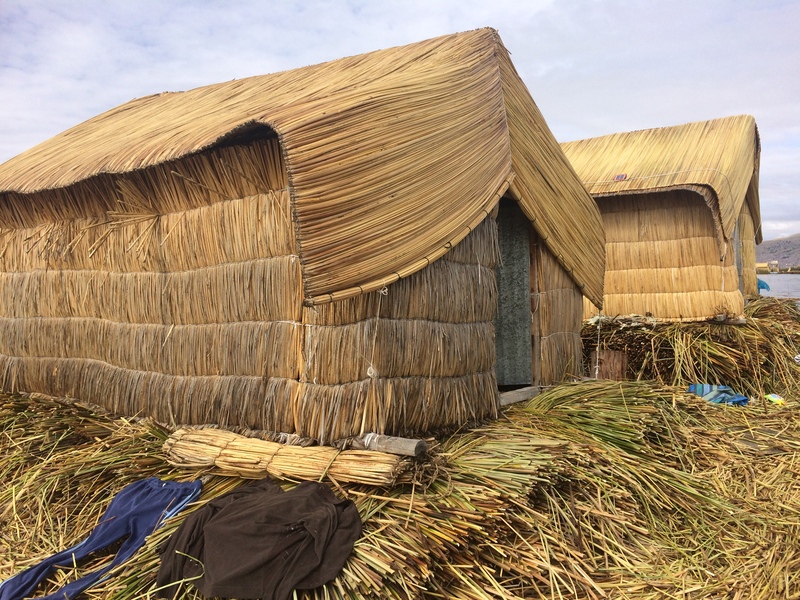 Whether or not these reed islands still exist as habitations or simply for pure tourism, they are no doubt fascinating! I’d like to mention again just how touristy these islands are. A man beckoned our group to check out his reed boat and the next thing we knew he pushed the boat away from the island and took us around the lake for just a few minutes. Right before getting off the boat, he requested each person to pay him 10 soles (~$3.33)! We were tricked into paying him. 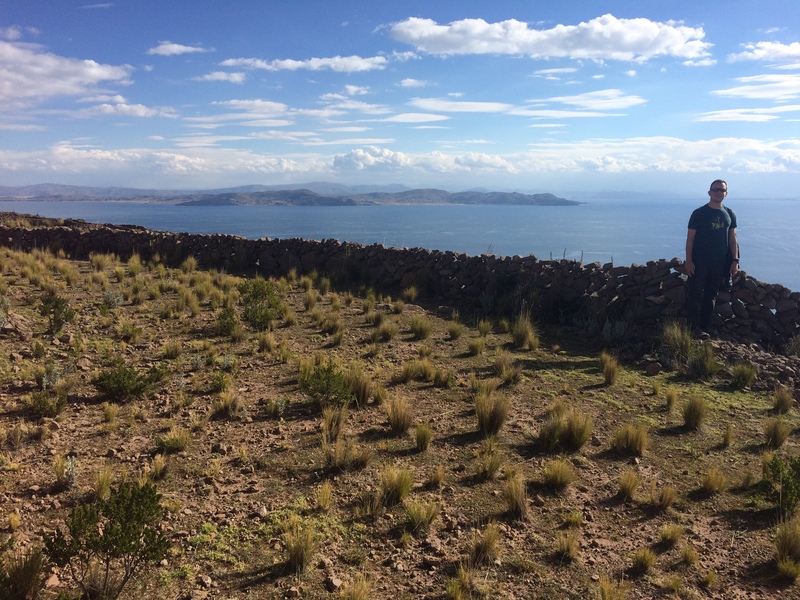 From this moment on we knew to be wary of the rest of our time on Lake Titicaca on the Peruvian side as if we were in Southeast Asia. 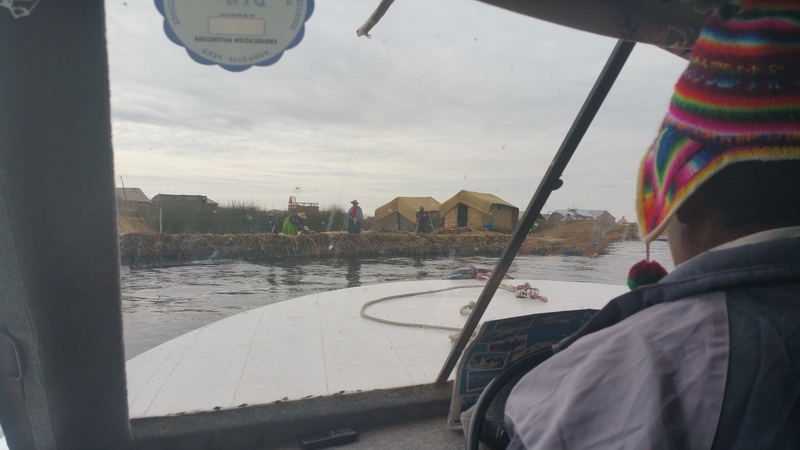 Not long after being tricked we set out for Taquile, a long 2-hour boat ride from Uros. 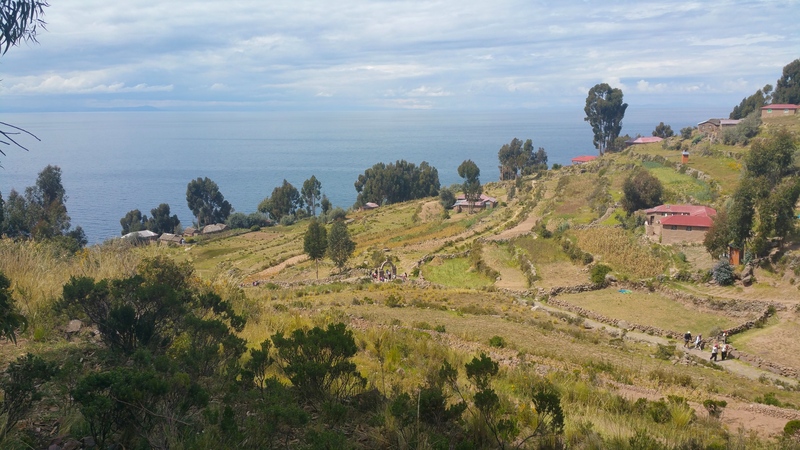 Taquile is a tiny island (about 1.5 km wide and 5.5 km long) composed of steep hills and walkways. There are no cars, motor vehicles, or bicycles. Everyone does transport by foot. In addition to agriculture it seems as if their primary industry is tourism. 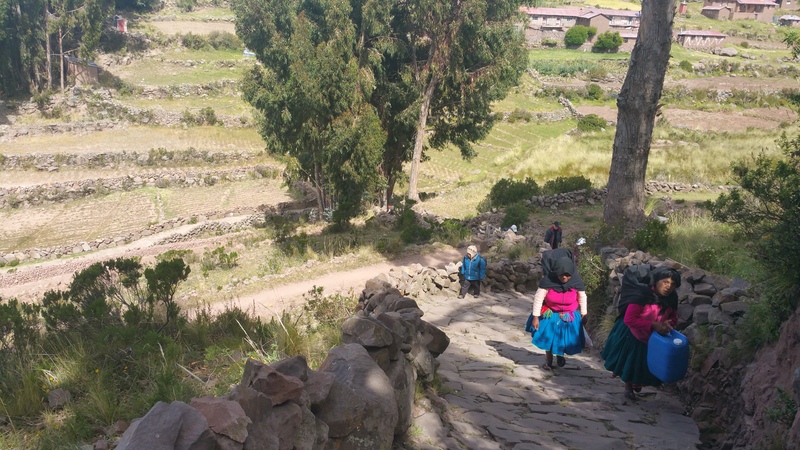 They seem to profit the most from selling their fine hand-made alpaca crafts and food to tourists. Everyday when boats arrive to the island, the elders of the island dictate where the tourists will eat for lunch, divvying up the people and profits for each family. 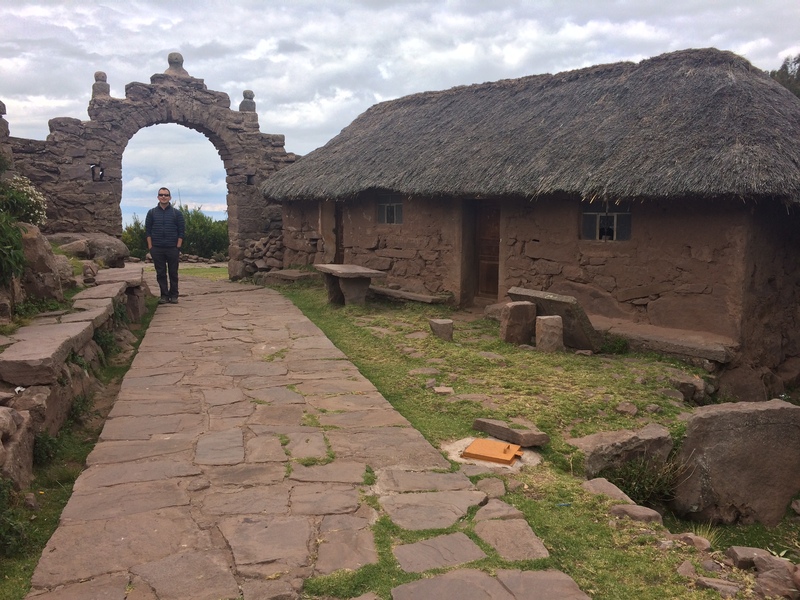 Unlike everyone else doing a day trip from Puno, we set out to Taquile to hike the island and spend the night with a family. Another reason for not wanting to book a tour was the ability to pay the family directly so the community could benefit. As soon as we stepped off the boat I overheard the elder of our boat tell a man on shore that we would be staying at his house, and then we were passed on. His name was Seser and for some reason he was in a hurry to get home. 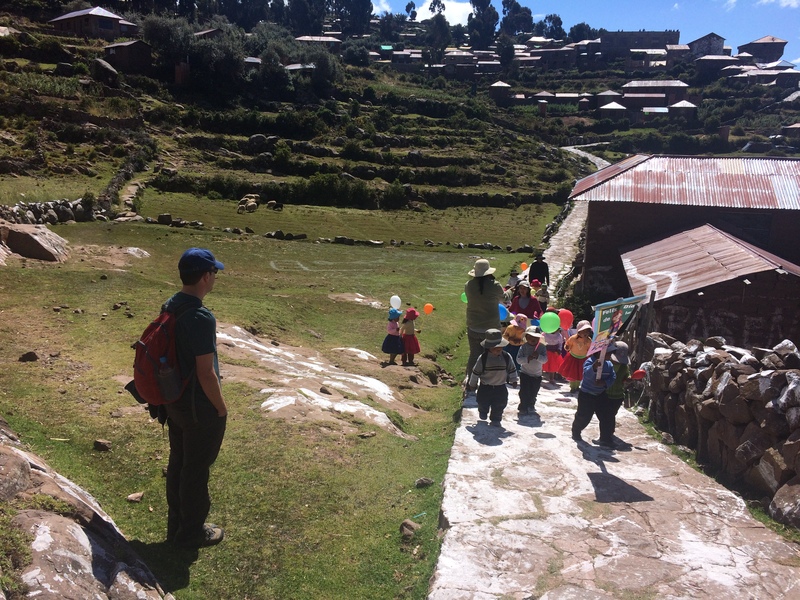 Chasing him up the steep hills at 3800 meters elevation and zipping by everyone else was no easy task! There is no running water or electricity on the island. We had a candle for our room, and our mattress was on reeds! A large day-tour group showed up for lunch not long after we checked in, and we took a powernap before heading out to the mirador, the highest point on the island. As we headed out in the direction everyone else was walking against, we were glad we were staying on the island instead of being rushed through a group lunch. Chris even bought some handmade knitted alpaca gloves! Of course there was no one else on the walk up to the mirador, nor was there anyone at the mirador. 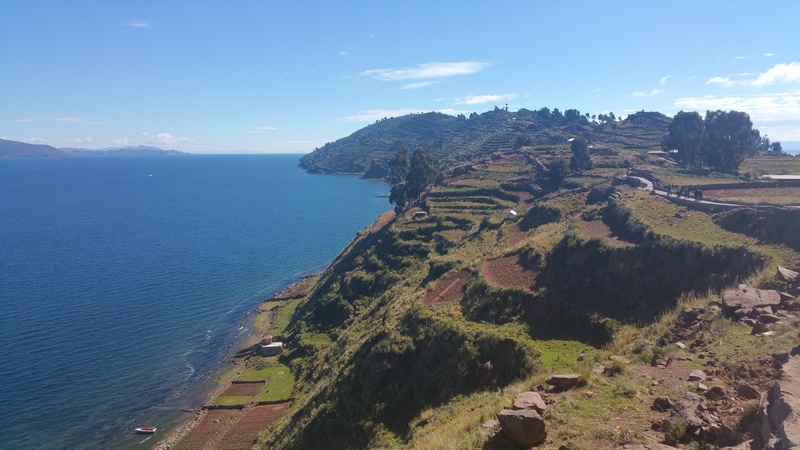 We had the whole place to ourselves and we enjoyed the beauty, silence, and serenity of Lake Titicaca without another soul. We eventually wandered back down and returned to our lodging for the night. Seser immediately ushered us into his large common room with large windows boasting views of the beautiful landscape. At first we thought he was being accommodating but within minutes of sitting down he tried to sell us a book (in Spanish), and some more handcrafts. 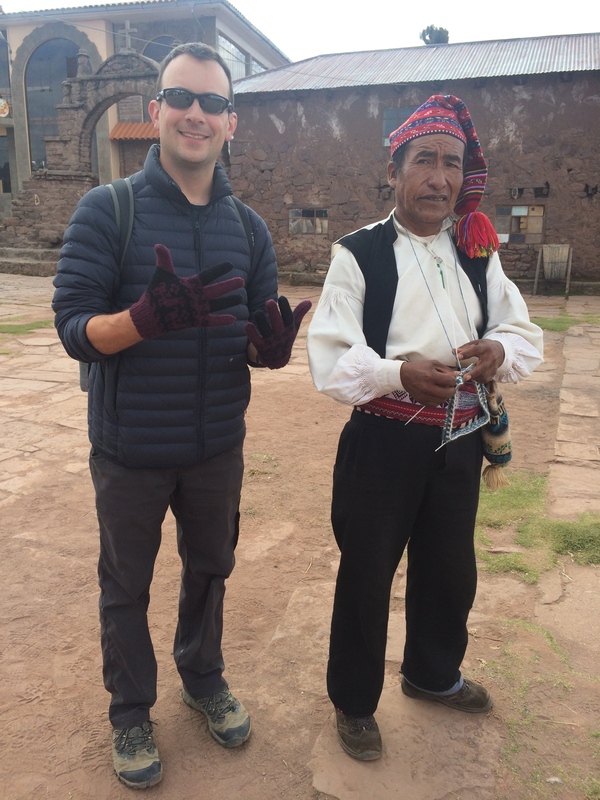 He also happened to have 500 Chileno pesos and one euro, and asked us if we were interested in doing a money exchange with him. 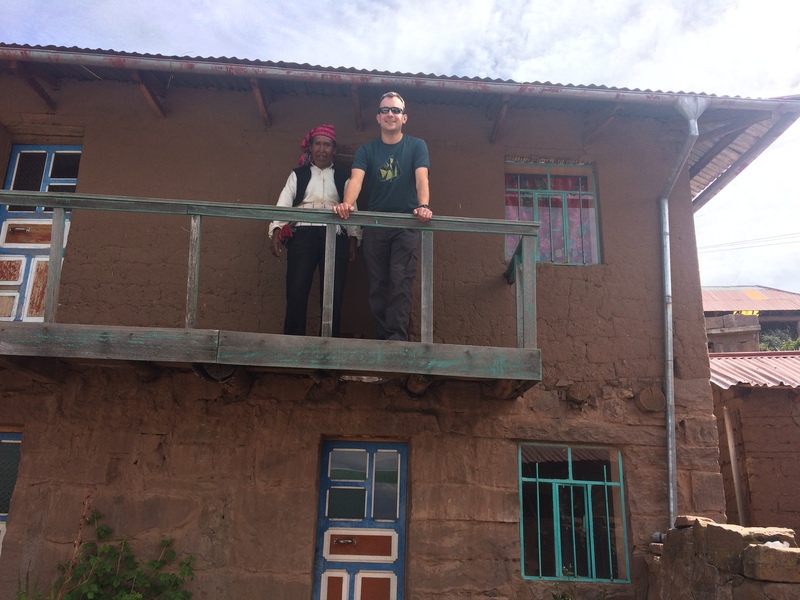 What kind of homestay was this? We were incredibly turned off, politely declined, and immediately retreated to our room. Fortunately, a soft rain began to pitter-patter as the late afternoon welcomed the evening, and the distant rumble of thunder overhead made for a relaxing time before dinner. Because we expected a homestay experience, we were quite disappointed when we were led back into the large, common area for dinner in the silent darkness. 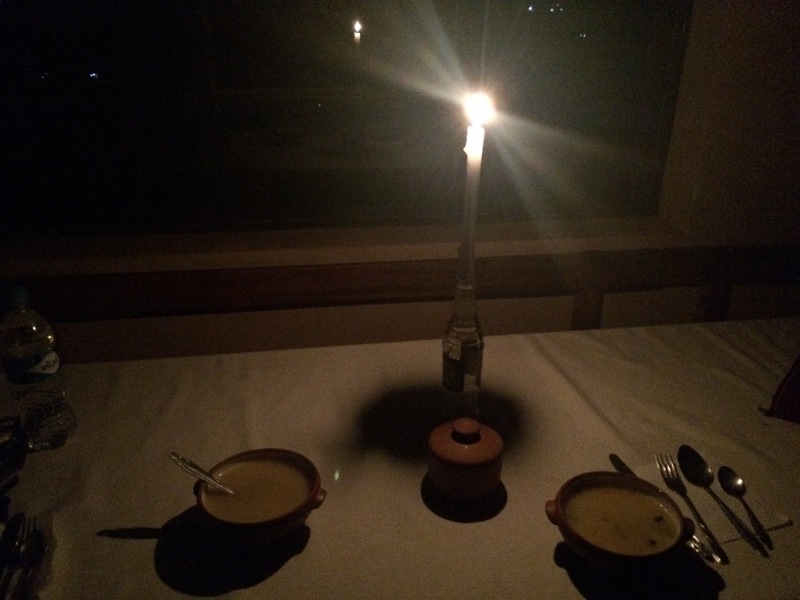 We had a light dinner of vegetable soup, rice, and eggs before candlelight, and the rest of the home was in eery silence. The view of the island before us was also pitch black, with only a few specks of light coming from homes equipped with solar power. The next morning after a yummy breakfast of pancakes, local muña tea, and fried Taquile bread, we ventured toward the south of the island to explore before the next wave of tourists could arrive in the late morning/early afternoon. We found a beach at the far southern end of the island! For lunch, we returned to Seser’s again (mainly because rain was coming and we wanted to hang out in our room before our 2:20 departure). Lunch was delicious local fish (trucha), fried potatoes, and rice for 20 soles (~$7). Expensive, but the typical price for the tourist on the island. We were relieved he didn’t try to sell us any more hats or scarves or whatever the hell else he could find. 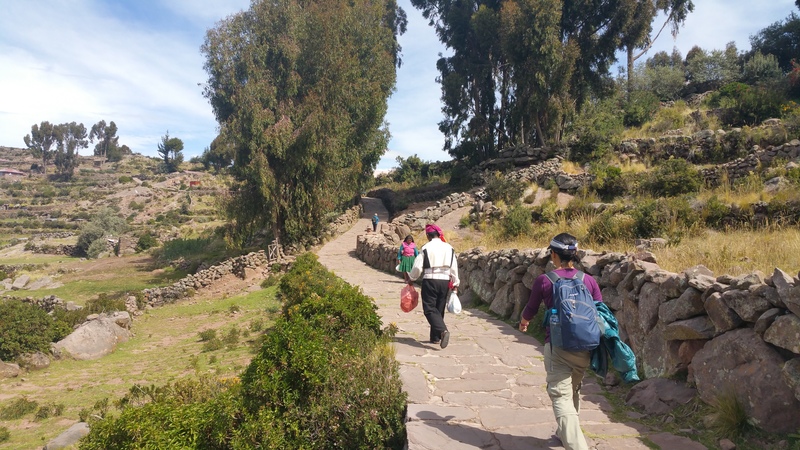 In general we enjoyed spectating the Uros Islands and hiking around Taquile. 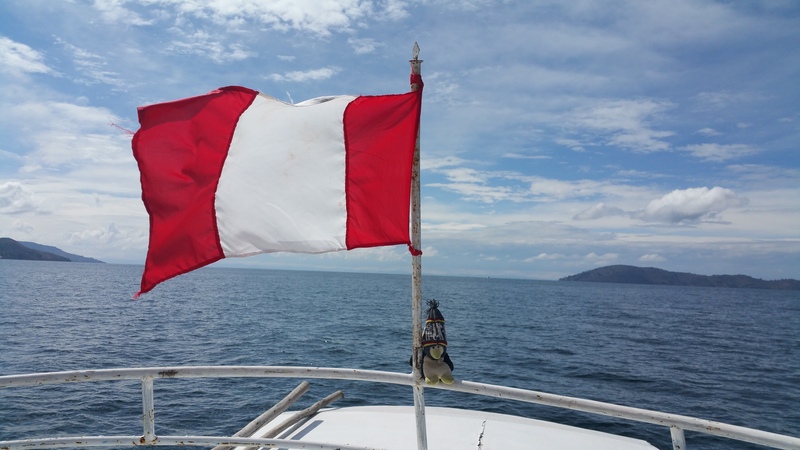 Excluding the stupid reed boat scam, the gloves, and a Coke, we each spent only a total of 90 soles (~$30) for the round-trip boat ride, basic lodging, dinner, breakfast, and lunch, which is a steal because I met someone who paid 100 soles for just a daytrip tour with lunch. 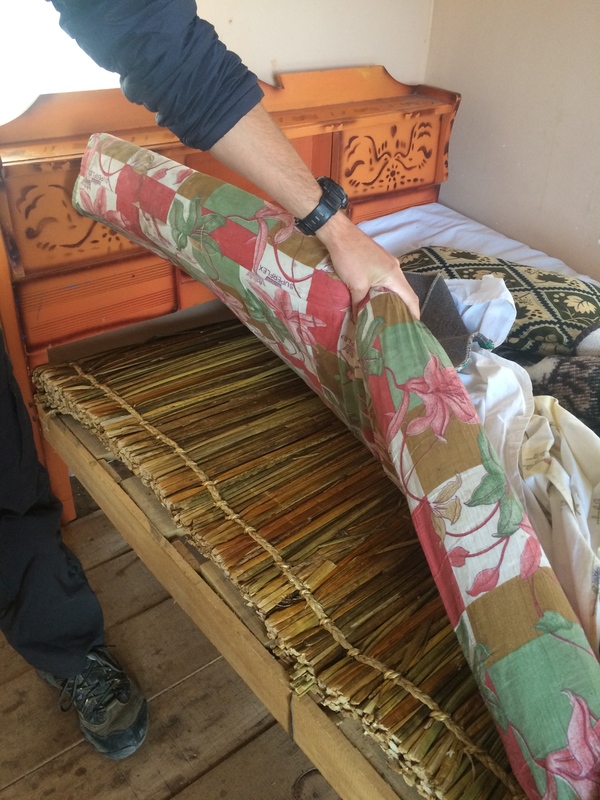 However the experience was slightly hampered by the reed boat scam on Uros, and the constant hard sells by our “host.” Had we had the expectation that we were merely receiving room and board and not an authentic home-stay experience with an indigenous family, we probably would not have left disappointed. 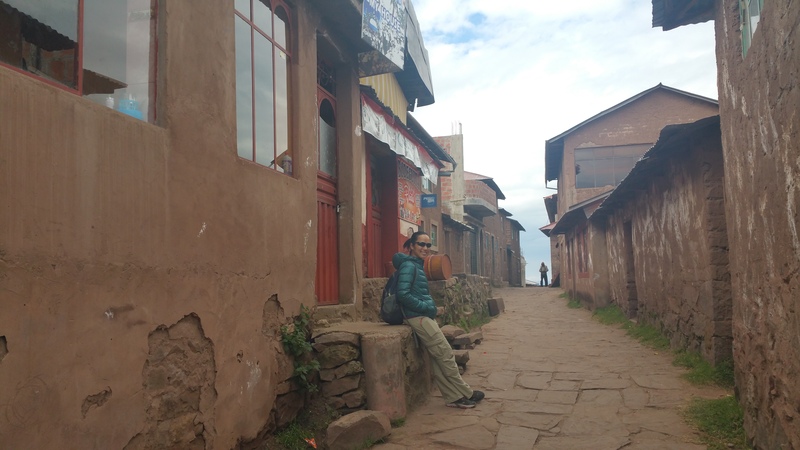 This entry was posted in Peru and tagged taquile, uros. Bookmark the permalink.